I’ve scoured the Apple and Android marketplaces for the quintessential apps for whatever your calling may be this season. Here’s your green light to dump the Doodle Jump and pick up one or all of these top picks. Hopefully by now your brand has joined the 40+ million users in sharing photos with the widely popular mobile app Instagram and hopefully it has proven to heighten engagement, provide compelling content and afford your brand added depth. If not, go do that right now. I am sure you’re an all-star when it comes to applying the perfect filter or capturing the perfect angle, but there are a few features and tricks Instagram yields that are a little less obvious that will help attract and engage your awesome brand army! If you are reading this, I am going to assume you are the woman or man with your hands on the brand (say that five times fast! Just kidding. Don’t.). And since you are assigned that role, I’ll also assume you are a wildly enthusiastic creative solar flaring with the brightest ideas your company has ever seen. I’m like a mind reader, I know. Where you will win with hashtags on Instagram is by designing a unique hashtag with longevity. A hashtag that will accompany every Instagram photo you share. The reason for this is being that your hashtag is tied to a compelling piece of visual content that can then be in turn displayed on your website, Facebook, G+, or micro-blog by way of RSS or a third-party aggregator such asStatigram or SnapWidget. You now have created a visually stimulating driver for your social platforms, website and blogs; a place where your fans can check out what you’ve been up to and easily share giving your profiles and content a little more muscle. Additionally, by remaining consistent with your hashtags on Instagram, you are setting the record for how the hashtag should be used within the social space further fortifying visual branding within your social communities. Using Instagram works like this: Take a photo, make it awesome with filters, write a clever little caption and share it. Right? 100% right, just not 110% right. I know it may not sound astonishing, but you’d be surprised how your community responds when they know your brand is out and about interacting in an interesting place or just places in the neighborhood. Really send it all the way home with the location tag. In a year when Instagram’s user base and popularity skyrocketed, there was no doubt in my mind that July 4th, 2012 was going to yield really great photos. My feed included many great shots from friends across the country, so I though I would share a few here on my site. Check them out! This is my first time posting with the mobile WordPress app for the iPhone. The app so far has allowed me to easily view, edit and publish new blog posts. I don’t publish a ton of personal photos or personal thoughts in general, but I anticipate posting a lot more photos accompanied with brief reflections more frequently. 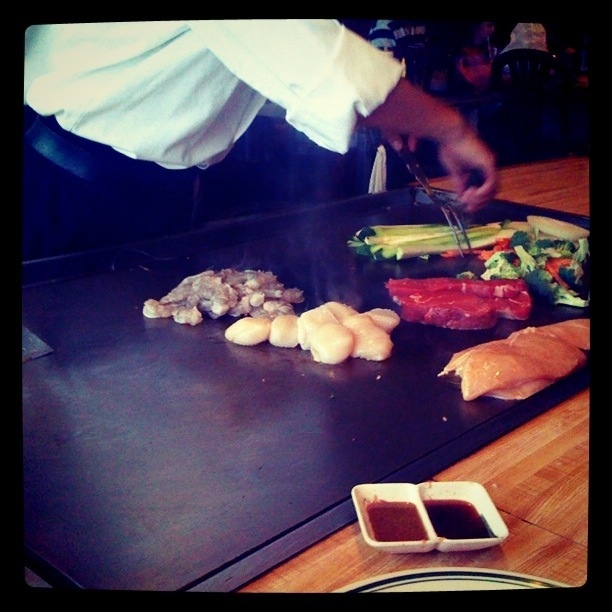 Here’s an Instagram photo taken at Kotatsu in Ardmore (Suburb of Philadelphia). This was an awesome meal and experience with my family. It’s rare that I sit down with so many members of my family, but I appreciate and relish every chance I do get to.